Supersonic additions – The Bug, Nicholas Bullen and the Finnish invasion! First and foremost, we are thrilled to invite back former Supersonic Festival alumni, someone who appeared at the very first Supersonic in 2003 (he also performed again in 2008 and with King Midas Sound in 2010) we are of course speaking of Kevin Martin aka The Bug. This time, Kevin Martin will be bringing the party vibes accompanied by the world’s fastest rapper and founder of Raggamuffin hip hop Daddy Freddy and Flow Dan (co-founder of UK Grime collective Roll Deep). 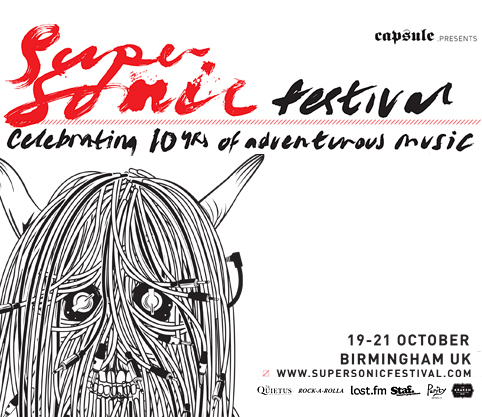 What Supersonic Festival line up would be complete without a local hero? For the tenth birthday celebrations, Supersonic are delighted to host the latest project of Nicholas Bullen, forever pushing and evolving ways of working with sound. With a highly impressive career spanning 35 years having founded Napalm Death and since established himself as sound artist and composer in his own right. Nicholas Bullen is known for his captivating multimedia performances and his omnipresence will undoubtedly be witnessed across the entire weekend. Stay tuned for more information regarding his involvement soon. Bringing great diversity and an air of playfulness to the festival are a trio of musicians from the Finnish label Fonal Records. Visual artist and musician Islaja will marvel with her compelling combination of her unique vocal delivery and interweaving of a rainbow of instruments. Lau Nau, the free spirited Finnish artist otherwise known as Laura Naukkarinen playfully and expertly blends ethnic tinged folk songs with curious and intuitive sounds conjured from both familiar and exotic sound sources. And one of the most recognised experimental music makers, Jan Anderzen will perform as Tomoutonttu offering an exuberant cacophony of streams, mutilated voices and found sounds resulting in an all-round ecstatic display of contemporary music. Over the next few months an exciting programme of film, talks and exhibitions will be revealed, including the unveiling of plans for sonic led dining experiences at the festival. There are still some more musical additions as well, all exploring & celebrating 10 years of adventurous music.